I think one of the nicest collectibles from Ewoks and Droids are the original animation cels. Personally I don't own any, but you can look on Ebay pretty much any time and find some nice ones, especially from Ewoks. Droids cels are harder to come by. I don't think I have ever seen any cels from the Thall Joben or Jann Tosh storylines on Ebay, so I think it's safe to say that they would be a pretty rare find. Here is a nice example of Horville from the Ewoks episode 'Horville's Hut of Horrors'. 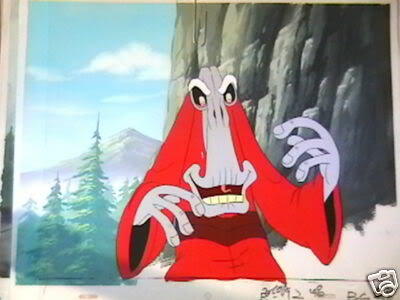 While the cel is placed on an original Ewoks background, it is not a proper match with the cel. Horville never appeared in such a location. This mismatch is common for many of the cels that come with backgrounds. Here is another one featuring Wicket and Chukha-Trok. With this one, there is no painted background, but there is an original sketch sheet. I agree that animation cels are really cool - I've admired them but never bought some until this year - I bought a group of 4 cels that make up one scene, and then I framed it myself. I think it turned out really nice - I love it because its a group shot with a bunch of different Ewoks, including main characters. So good to find others who love these as much as I do. If you pop by, please let me know what you think! Thanks! A whole site dedicated to cels - how awesome! Its great to see something like that exists - there are so many Droids & Ewoks fans and collectors out there, glad another one made it to this site to share their passion. I absolutely love your site! 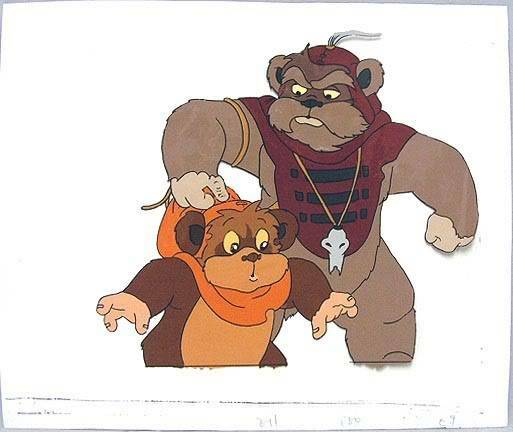 After years of being limited to seeing Ewoks only in poor quality videos it's so nice to see such a large collection of high quality cels and see what the characters were meant to look like. I started buying some cels last year, and so far I have a group scene with most of the main characters in it, a Shodu and Malani cel and a sequence of 8 Latara cels. I still need to get one from Droids. I wish there were a wider range of Droids cels out there. They seem to be a lot harder to come by. You're right DS, there are very few Droids cels that survived but I believe it was a flood at Nelvana that destroyed most of them. I have a couple of Ewoks cels that have water damage too. Of the few Droids cels that survived, most were sold to an art warehouse who produced some sericels. Over the years, they have become rarer and rarer to find. Shane who I worked with at Rebelscum is really into Droids so he has some premier pieces. I could never afford to get the big ticket items, so I am glad there are so many Ewok cels; the prices are ridiculously low. I noticed a few Droids items on eBay, but you have to be very careful they are not sericels. James! I have to thank you so very much for the post announcing my site on yours! You are too kind; what a great surprise to read it! I am so glad you like my website; I have been wanting to do a dedicated one for years instead of just a page on my old SW site. I have always said my two favorite parts of my SW collection are my autographs and Ewoks cels. If I ever had to sell off my stuff, those two groups of items I would always hang on to. Oh right, a flood, I knew it was some type of disaster. Its a real shame - but at least there are countless Ewoks cels in the hands of many collectors. Your welcome Maureen! Your site is something that all Ewoks fans need to know about. I really like those re-animations! I'm wondering, how do you like to store your cels? Mine are still in the plastic bags and envelopes that they were shipped in. I need to figure out a better way to store them! Ah, thank you James! Making those animated gifs are so much fun... it's very cool to see what happens the first time you run it! When I first started collecting cels, I kept adding posts and expanding a single book. It got way too heavy and bulky. Now I have 12 books with my most prized cels, sorted the same way I have organized my Cels By Characters page. Those hold the 300+ that I have on that page, but I still have a lot (another 600+) I need to scan and organize; sequentials I want to create more animations with. For now they are boxed up. What is also nice about these scrapbook pages, is that you can slide more than one cel into each page if you wish. I have some cels that are so similar, I store them together. Hope this helps you out! Like I said, at first I wanted to get proper binders, but at nearly $ 50 each at our local art store, that was way too expensive. That looks like a great way to store them and browse them as you'd like - do you have any framed though, and on display? In my "Star Wars" room (half my basement), every inch of the walls are either covered in autographs or carded figures. Upstairs, where I keep my cels in the spare room (because it is flood season and I am NOT going to chance ruining them), I have my Pirates collectibles, Captain Jack posters and my Johnny Depp autograph! My craft room walls are covered too....with, er... crafty stuff. I need an "Ewok Room". I guess for now I'll keep them in binders. Haha, you should have at least one framed! To me, they are more than animation history, they are art, if you scroll up, you'll see mine framed - its 4 separate cels making up one group shot (which I love). Its above my desk at my house, oddly enough its the only SW item I have hanging up at the moment! PS- Do you know what episode mine is from? You are absolutely right; they ARE pieces of art... and I think that is why I love cartoons so much. I love to draw and paint too, so the huge task of creating cartoons (at least before they went digital) is not lost on me. I can't imagine the patience and talent each and every frame took to create. I really SHOULD frame one or two. Scroll down to the bottom and you'll recognize it I am sure! Maureen could add it to his web site. This shows Kneesaa afraid with the Stranger's fire during the episode Night of the Stranger. So far my site is just the cels I own, but it got me thinking, perhaps I will add a section for "guest" cels.... those from other's collections! Hmmmm.... if I do, I definitely would love to add her! Thanks! 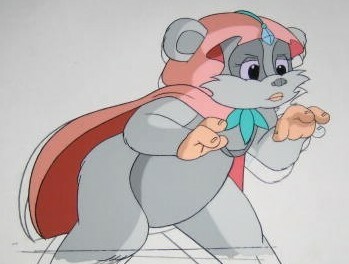 I am really tempted to get some of those Ewoks cels, but I'm a little too low on cash at the moment. Plus, I just bought my first Droids cel a few days ago, so I have to resist going overboard with these. It's tough though! I post the new cel when it arrives. That seller has a few nice ones, but I hope the shipping is cheaper within Canada - shipping to the US is $21.25 for ONE cel!